"This is a simple yet delicious recipe. For extra richness, mayonnaise may be substituted for the yogurt and salt." Soak raisins in hot water for 30 minutes. Drain and dry. 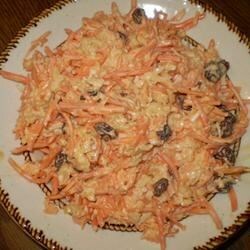 In a mixing bowl, combine the raisins, pineapple and carrots. Mix together the yogurt, sugar and salt. Add to carrot mixture; mix well, cover and refrigerate. I liked this recipe because it didn't use mayonaise. I didn't put any of the sugar in it. I think it's sweet just with the yogurt and pineapples in it. I make this durning the holidays and summer time and my family loves it and ask for it all the time, very easy to makeand I do and Apple to mine, peeled and sprinkled with lemon juice.